At American Skin Institute we invest a lot of time and energy to find the best, cutting edge technology that can help our patients with various skin conditions, including laser skin treatment options for spider veins, wrinkles, rosacea, and many more. As part of our effort to bring the latest skin care technology to all of our patients, we’ve recently added the Vbeam laser to our top of the line Laser Center. The Vbeam is an advanced tool that can provide many laser skin treatment options, and can be calibrated by American Skin Institute providers to address specific skin problems in a highly targeted manner. Further, laser skin treatments with this device are painless, and can produce visible results in as little as 1-3 sessions. 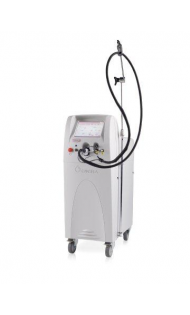 The Vbeam is a pulsed dye laser that works by delivering rapid bursts of gentle light wavelengths to the skin. When the light hits the skin, it becomes converted into heat energy, which is absorbed by specific blood vessels or melanin pigmented areas in the dermis, depending on the condition being treated. This can force the destruction of abnormal skin cells and blood vessels, which are then removed from the body by natural processes. For example, American Skin Institute providers have effectively used this laser skin treatment to target spider veins on the face and body, treat rosacea, get rid of dark spots on face, lighten scars, and even rejuvenate the skin to reduce appearance of wrinkles. Is the Vbeam Laser Skin Treatment Safe? It’s important to point out that the Vbeam treatment is very different from laser skin resurfacing procedures. The goal of traditional laser skin resurfacing is similar to chemical peels; to destroy old or dying skin cells, which stimulates the growth of healthy cells in the treatment site. The Vbeam laser treatment, on the other hand, does not have this effect on the skin and aims to preserve the surrounding tissues. Laser skin treatments with the Vbeam device are very safe and pain-free. The applicator tip of this laser is equipped with special cooling technology, which delivers cooling spray moments before the actual laser bursts. This ensures that the surrounding tissues remain undamaged by the laser skin treatment, and that only the targeted blood vessels and skin cells with hyperpigmentation are affected. American Skin Institute providers always ensure that you are as comfortable as possible during a laser skin treatment. Most patients are reclined or are asked to lie down; depending on the area being treated. To protect your eyes, your American Skin Institute provider will provide you with safety eyewear that will neutralize any laser light and keep it from hitting your eyes. When the laser skin treatment begins, the Vbeam device will be calibrated and parameters will be set based on the specific condition being treated. Our providers take great care during this step, because each condition is unique, and by expertly calibrating the laser light wavelengths we can maximize positive results after treatment and reduce the number of follow up treatment sessions. like the lips, and don’t experience any down-time after the procedure. And because treatment can be completed quickly, many American Skin Institute patients come to our Laser Center during their lunch break. If you’re interested in addressing spider veins, hyperpigmentation and wrinkles with the Vbeam laser skin treatment, we currently offer fast appointments at our Laser Center in Sherman Oaks. Please give us a call, or fill out the contact form below!